When Buenos Aires native Eduardo Makaroff and Swiss born Christoph H. Müller met in Paris during the creation of Gotan Project in 1998, they both already have a rich musical career background, in their countries of origin as well as in France. 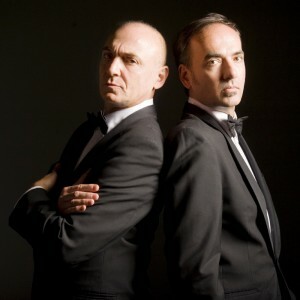 With Gotan Project in 2001 they released « The Revancha del Tango », « Lunatico » in 2006 and in 2010 « Tango 3.0?, three albums which were big international successes. Many of their songs were used in movies, TV series etc..
Three world tours with Gotan Project later, the association « Müller & Makaroff » takes a new dimension with « Reencuentro », a clip and a short film initiated by Renault and directed by Pablo Giorgelli (award winner at Cannes).